BaByliss Curl Secret Simplicity Gift Set in Hot Pink. Xmas gift tried once so it’s in mint condition. Dispatched with Royal Mail 1st Class. BaByliss Nano Pro 200 Straightener. 1 x BaByliss Nano 200 Straightener. Includes travel pouch for all your toiletry needs. Up to 200C high heat performance. 1 x Toiletries pouch. Ceramic plates for a smooth shiny finish. The BaByliss Pro Crimper 210 has salon quality heat system that heats up in seconds. Stylishly designed with a sleek black look, the BaByliss Pro Cordless Straightener looks as good as it performs. We all know that gas heats up quickly and gives off natural warmth that just can’t be recreated with electrical heaters. MPN: 2385U. BaByliss Tight Curls Curling Wand. 1 x BaByliss Tight Curls Wand. Continue until all of your hair is curly. To style simply run your fingers through your hair to break up the curls. Create on-trend, voluminous tight curls. Simply press the hair between the plate and the ceramic barrels to create the wave effect. Auto shut off in case you forget to turn your styler off. Extra-long 2.5m cord. Advanced Ceramics™ for ultra-fast heat up and consistent temperature during use. Professional hairdressers know that the ideal way to give hair a smooth, shiny finish is using tourmaline-ceramic plates in their appliances. Create your own look. Crimp random sections to add interest - this looks good on up-does. All BaByliss Products are thoroughly tested to give the ideal performance and results possible. With five digital temperature settings this product is suitable for all hair types and with enhanced ceramics to maintain constant high heat during use and a top temperature of up to 210 degrees C, the BaByliss curling wand pro provides high heat for salon ideal results. 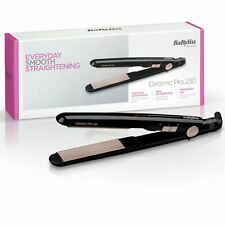 The BaByliss Pro Ceramic 230 is a high specification straightener. It has a top temperature of 230 degrees Celsius for those with thick, curly and/or wavy hair. It also has a lower heat setting for those with finer, straighter hair who prefer to apply less heat to their hair. BaByliss Curl Pro 210 Tong. This 210C salon performance tong makes creating gorgeous curls quick and easy. The 25mm tourmaline-ceramic barrel creates perfectly defined curls with a smooth shiny finish. Get effortlessly beautiful curls with the BaByliss® 2663GU Curl Secret™ hair styler in pink and Mirror. Its pioneering Auto Curl™ technology gently draws hair into the ceramic curl chamber and heats it from all directions. Babyliss Cordless Gas Tong & Brush 2583BU (No Box). Condition is New (used once but my hair it too long). Comes with a box of 2 new cartridges. Ideal for holidays etc Dispatched with Royal Mail 2nd Class. MPN: 2764U. 38mm titanium-ceramic barrel for smooth body and shape. Frizz free hair is achievable with ionic conditioners to smooth hair cuticles as you style. 2 heat settings plus cool shot. 500W power for use on damp hair to dry as you style. Used by the world’s leading hairdressers, the BaByliss Pro Crimper 210 has salon quality heat system that heats up in seconds, so you never have to wait to try out a new hairstyle you’ve spotted. The Pro Crimper 210 has everything you need to give your hair long lasting shine and texture. MPN: 2284U. BaByliss Defined Curls Tong. The BaByliss Pro Curl Tong has high heat performance and reaches up to 195 degrees C for fast, easy curling. With a 19 mm ceramic barrel, it is ideal for creating smooth, shiny curls. Box Contains - BaByliss Tight Curls Wand. Continue until all of your hair is curly. To style simply run your fingers through your hair to break up the curls. Hold for 6 seconds before sliding the wand away to reveal the bouncy tight curl. Babyliss curl secret boxed hardly used. Condition is Used. Dispatched with eBay delivery – Shutl 2-3 days. 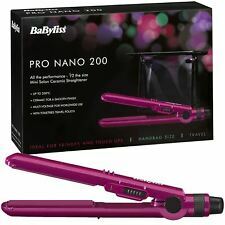 BaByliss Nano Pro 200 Straightener. 1 x BaByliss Nano 200 Straightener. Includes travel pouch for all your toiletry needs. 1 x Toiletries pouch. Ceramic plates for a smooth shiny finish. Box Contains. Fantastic condition as shown in photos, no box or instructions included. 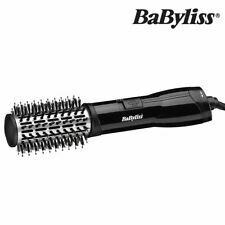 TheBaByliss 2800DU Multi Style has a ceramic finish with heat up to 200°C for fast, professional results. The ceramic coated plates give even heat distribution to ensure whatever style you choose you'll get a smooth, shiny finish. 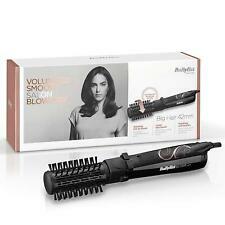 The BaByliss Large Cordless Gas Styler heats up fast to high temperatures and is easy and safe to use. The light at the end of the barrel should now be on and the tong should begin to heat up. Wait for one minute. MPN: 2179U. Nano-ceramic plates glide through the hair for ultimate smoothness. Wide 45mm plates style larger sections at one for fast results. 20 temperature settings for all hair types. For use with Babyliss portability stylers. The energy cells will also fit Vidal Sassoon appliances (excluding models 702, 704 and 706). 2 Long lasting energy cells each give up to 4 hours continual use. Babyliss C1100E Curl Secret Ionic Waves NEW and OVP. Babyliss MS21E Multistyler 10 in 1 new and original box. Marke Babyliss. Remington S6505 Pro sleek & curl hair straightener straightening irons new and original box. MODEL NUMBER: 2885U. LARGE 50MM CERAMIC BARREL GIVES ULTIMATE FULLNESS AND BODY. SALON PERFECT BLOW-DRY FINISH - GLAM GLAMOROUS HAIR AND BODY. 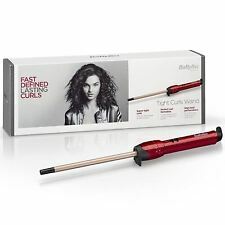 BABYLISS MULTI-STYLER STRAIGHTNER, CRIMPER, TONG AND CURLER, BRAND NEW IN BOX. Dispatched with Royal Mail 1st Class. All BaByliss Products are thoroughly tested to give the ideal performance and results possible. The BaByliss Pro Crimper 210 has salon quality heat system that heats up in seconds. BaByliss The Crimper ! BaByliss 2777U Big Hair 42mm Rotating Hot Air Styler Brush. Let the rotating barrel easily create that all-essential body and bounce, whilst the soft bristles give your hair an amazingly shiny finish. HAIR TONG / BRUSH. CORDLESS GAS. ENERGY CELLS BOTH GOOD CONDITION. 1: SLIGHTLY USED. Banyliss You Curl. Condition is Used. ---Pioneering Auto Curl technology to effortlessly create beautiful curls with long-lasting effect ---Easy to use, hair is automatically drawn gently into ceramic chamber where it is softly heated to form the perfect curl ---Professional heating system for fast curl formation ---With 2 heat settings of 210C and 230C and 3 timer settings, it creates different curl effects with longer, lasting results ---Auto alternating curl direction for natural, effortless curls Babyliss Curl Secret has pioneering Auto Curl technology to effortlessly create beautiful, free-flowing curls with long-lasting effect. Hair is automatically drawn in to the ceramic curl chamber where it is softly held and gently heated from all directions to form a curl. Simply release the Curl Secret styler from the hair to reveal the perfect curl. Travel in style with the BaByliss Pro Cordless straightener. Its enhanced gas powered heating design gives you salon quality straightening performance wherever you go. Designed to be small enough to fit in a small travel bag. 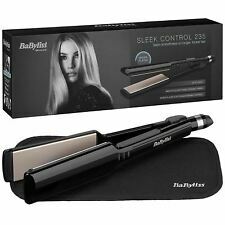 BaByliss 2667U Curl Secret Hair Styler - no box but complete with luxury pouch. 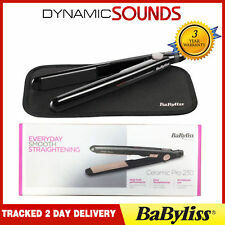 BaByliss 2667U Curl Secret Hair Styler - no box but complete with luxury pouch, heat protection mat and cleaning tool. It has 2 heat settings and 3 timer settings with audio beep indicator. Automatic curl direction provides a natural look and finish with long-lasting curls. Really easy to use!! Condition is Used but has been used only twice so is as new. Dispatched with Royal Mail 1st Class. BaByliss ST270E - Myltistyler ipro 230 Plus UK Adapter. - EXCLUSIVE iCurl system : straight & curl easily with both sides. - Protection: ultra-fast heat recovery for constant high heat. - Ceramic intense : Titanium Ceramic coating. Babyliss Curler / Wand / Tongs Excellent Condition. Only used a few times, very easy to use. From a pet / smoke free home. Professional Wet/Dry Steam Hair Straightener. • Product:professional ceramic hair straightener. 1X Hair Straightener. • Steam settings(30-60s to Steam Up) vapor-blast hair with unbelievable shine and smoothness.